Traditional deep sea drilling rigs are bulky, expensive and need a relatively stable platform to operate, so they can't work in rough weather. These next-generation drill systems, however, bypass the problem completely by setting up shop on the seafloor. The main issue traditional rigs and semi-submersibles have is that the drill rods start at the water's surface and have to travel through thousands of meters of water before they even hit the seabed. Combine that distance with roiling surface waves and you've got an incredibly complicated system that requires specialized, expensive equipment and suffers from severe limitations in how and where it's used. Boats also have a tendency to float away from the drill site, regardless of whether they're anchored or dynamically positioned. These issues can result in as much as 50 percent downtime while the rigs are on-site. Obviously, this becomes an exceptionally inefficient means of drilling, especially as the oil and gas industry increases deep sea exploration in search of new wells. Per-day drilling costs have exploded, jumping from $192,000 per day in 2005 to $520,000 per day just two years later (and you were wondering why gas was creeping toward $4 per gallon). Seafloor Drill Systems, on the other hand, forgo the thousands upon thousands of meters of pipe completely. Instead, these systems sink a robotic drilling rig to the bottom of the ocean and tether it to the surface vessel via a long ubilical power supply. Essentially it's an ROV that doesn't move anywhere but down. The sinking and drilling operations are handled exactly as an ROV's: remotely, either from an offshore office, land or a surface vessel. Recent studies have shown that this method is 5-10 percent faster than traditional drilling means. Commercial versions, like the 22,000-pound Marl Sub-Sea Drill, can operate as deep as 9,850 feet beneath the surface and extracts core samples from 150 meters down. As the drill is lowered from the side of the ship, on-board thrusters compensate for drift and currents, guiding it to the proper landing spot where the rig automatically self-levels. 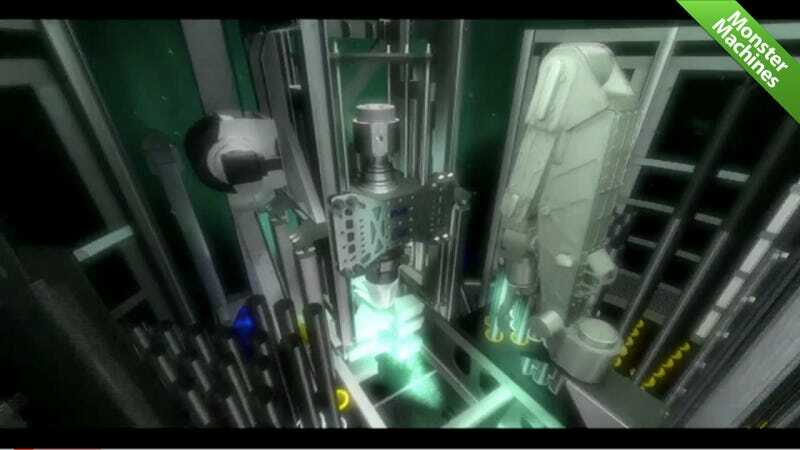 After settling on the seafloor, the 21-foot tall drill uses its eight-axis robotic handling arm to position and feed the drill into the drilling head while maintaining its alignment with the string (the drill string is what pumps in drilling lubricant or "mud" as well, as provides torque to the drill bit). Once the desired depth is reached, the core barrels are stowed and the entire rig is fished from the bottom.